As I've gotten deeper in skincare journey I've developed a thing for oils, I mean I literally have an oil for everything. The latest additions to my collection are from Monastery a new brand that I am obsessed with, I recently added two of their oils to my routine and I have zero regrets. The first oil is a treat for the body, I've been a fan of Lapiz oil for a while now, but I never tried it on my body and it turned out to be a luxury in a bottle. The scent alone hooked me instantly (think ginger and grapefruit) and the matte effect made it easier to slip on clothes right after without any greasy residue. 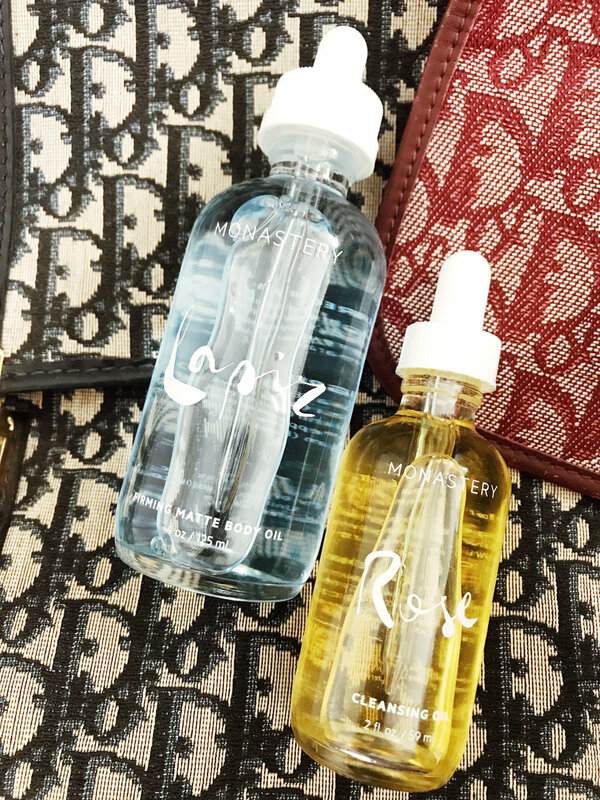 Oil cleansing your face is one of the best ways to restore moisture to your skin and doing it with roses doesn't hurt. The Monastery Rose Cleansing Oil is made with 100 rose petals and blended with sweet almond oil. I love using this product to remove my makeup, it makes my skin feels baby soft and gives me a slight glow without irritating my skin.